So got a little free time coming up and I want to use it to address some problems. I seem to keep getting oil in my intake, it's not coming from the filler neck, so from what I read I might have a bad valve on one of my other lines going to the intake. It always happens after a hard drive, if that makes a difference. My oil is not over filled, it's right below the full mark. Should I be looking into a catch can for all 3 lines? Also, I have a small ticking sound that comes and goes with no indication of what's causing it. I thought it was the SSV but it sounds like it's coming from the alt. I got a small clip I'll try to put up, but my home network is down so I'm doing it off of my phone. While watching the video keep in mind the mic is to the right of the screen. Last edited by 1.3_LittersOfFurry; 10-30-2012 at 06:37 PM. Take the alt belt off and see if it goes away...be careful that you don't run it for long...with no coolant circulation it will overheat...do it with the engine cool and you will have a bit of time to see if it goes away. It sounds like the same problem i have with mine. Its the SSV fluttering. Mazda told me its gonna cost me anywhere from 900 to 2000 for parts and labor. The good news they told me was that it wont affect your car if you dont get it takin care of right away. I was thinking of trying that but with the engine "warm" cause im scared to flood it. I've only experienced a flooded rotary once when I was 18, my parents moved my vert to do yard work and flooded it. It took me hours to unflood it. I ended up having to remove the plugs and put oil in to get it going, total nightmare.... I now live alone far away from home, and will be doing this in my complexe's parking lot with limited tools. My current plan of attack is to go drive the car till it's fully warmed, allow a 1 hour cool down then proceed with your steps. I only plan to run the engine 1 min tops with the belt removed. This should be ok? I should only need to run it long enough to verify if the noise has stopped right? Also, if the alt/water pump is not the issue then I'm looking at the SSV correct? 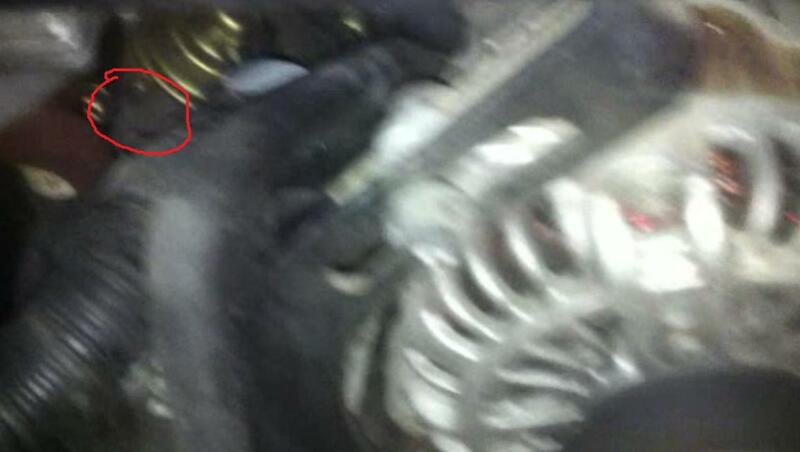 I have a small theory: car is driven hard, oil gets in the intake, SSV becomes clogged, SSV begins tapping. Cause some times there is no noise, and sometimes I go a few days without driving it hard. dannobre offered some good suggestions, but in the end, you'll need to help narrow it down by getting in there and figuring it out yourself. Taking a screwdriver to various parts of the engine to feel the ticking helps (though an automotive stethoscope works better). You can grab the SSV lever that connects the actuator to the valve and see if that makes the ticking stop. Last edited by Jon316G; 03-21-2011 at 10:42 PM. Well I have not been able to find the issue yet. 1. The noise stopped again, although I was able to get a finger on the SSV and move it fairly easy. 2. Brad Pitt decided to make a film in my complex so I lost my work area for the next few days. I use to also have oil in my intake system. It turned out that it was from pouring oil directly into the the neck. Cleaned it out and started using a ling spout funnel to get past the breather tub and the problem disappeared. You did say it was not a neck issue but thought I might as well mention it. Sorry for the lack of knowledge, but could you provide a picture to the lever that you speak of? I have a similar ticking problem as the OP. I have also tried poking around to see if the sound stops, but no luck so far. Any help would be great. My car just started making this knocking/tapping sound and just like OP describes it seems to come from the alternator or near. Could someone post a pic of this ssv lever. I have no loss in power so I dont think my engine is dying, well I hope not! Please help. BTW, the sound still hasn't returned on mine yet. Although my coils are defiantly failing now. Could someone post a pic of this ssv lever. Just watch the video I provided in post #7 above (2nd link). I'm moving the SSV by pushing down on the lever. Okay I am having the ticking issue intermittently and when i put my hand on the lever it stops. So does that mean the actuator is bad? I'm not sure, mine comes and goes. But it's definitely the SSV ticking in my case. Maybe it's clogged? Carb cleaner seems to make mine stop for about 1k miles r so. I use a vacuum pump to hold the valve open, have a friend keep the engine going, and drown it with carb cleaner through the brake line. I just replaced my oil injectors and lines not too long ago and while I had the manifold off I cleaned everything. If I put my finger on it while it's ticking it goes away. Same for me. Finger on the lever and the noise stops. Drown intake with carb clean and it stops for awhile too. It seems the linkage is loose but I'm really not sure. I havnt touched it since the noise stopped. I never seen the ssv apart in person for the 8. But I recently took my fc apart and all I can say is omfg of all the carbon everywhere. Wow 9k where have u been u stupid noob! There was an tsb about ssv sticking(I hate iPad's auto correct) and Mazda update the part with a beefier spring and slightly longer bolt to prevent it from sticking again. If yours is not sticking I don't see the point of messing with it. I never had issue cuz I drive it like it's supposed to be oh yea. So I never had any problem. But if one day cel shows up ... Then I think about it. Thanks. I have never had a real SSV issue in all these years. Mine is not sticking but I am wondering if i should just replace the actuator. i wanna make sure everything is in order before I boost. 1.6 hour job.... I think not! Thanks for the info nycgps. Saved it just in case.